Baystate Medical Center will join Americans from all 50 states who will celebrate the fourth annual Food Day onOct. 24 (a Saturday this year) by participating in special food events throughout the month in celebration of healthy, affordable, local and sustainable food. Food Day is a time to resolve to make changes in our own diets and to take action to solve food-related problems in our communities at the local, state, and national level. This year’s theme is “Toward a Greener Diet.” With Food Day, Americans can celebrate our food system when it works and fix it when it’s broken. The typical American diet is contributing to obesity, diabetes, heart disease, and other health problems. Those problems cost Americans more than $150 billion per year. Plus, a meat-heavy diet takes a terrible toll on the environment. “Eating Real” can save your own health and put our food system on a more humane, sustainable path. 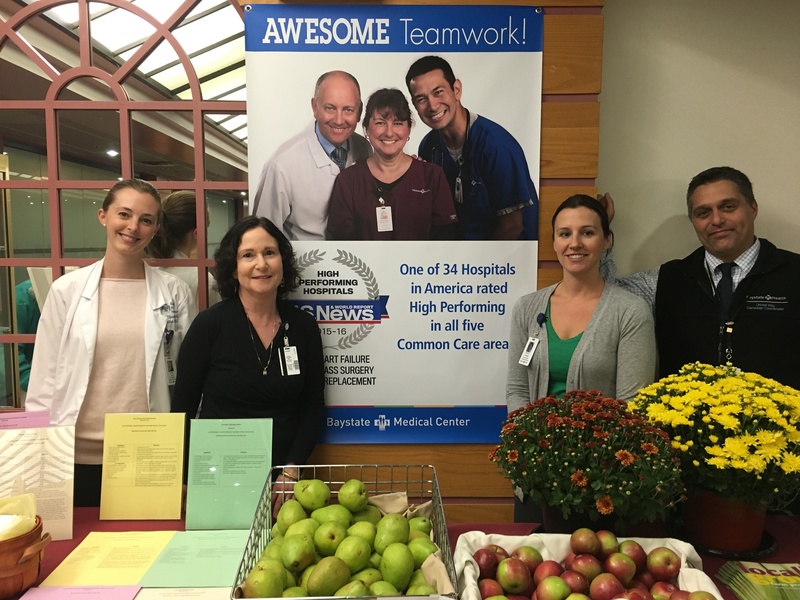 According to Nancy Robinson, director of Patient and Guest Services for Baystate Health, Food Day is a wonderful opportunity for Baystate Medical Center to promote and showcase its efforts to support fresh, locally-grown ingredients and its role in support of healthier, sustainable practices. “We have adopted pledges from the Massachusetts Hospital Association and HealthCare Without Harm to increase our purchases of local foods and antibiotic free meats. As a result, we have increased our local produce and dairy purchases from 6% to 44% of our total purchases in peak season, and greater than 20% in the winter months. We have also reduced our sales of sugared beverages by 35% by offering alternatives that customers like. And we are working collaboratively with our suppliers to increase the availability of antibiotic free meats that we purchase,” said Robinson. “This year we have also partnered with the University of Massachusetts Amherst in planning our Food Day activities. We anticipate this will be the first of other collaborations with them. The health of our communities and environment is a constant point of focus for us and provides direction as we develop new concepts. 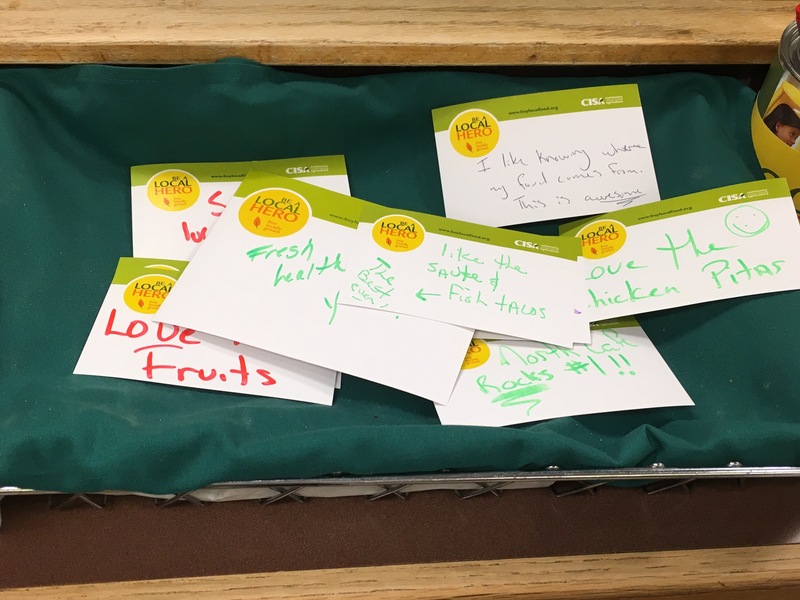 Participating in our second Food Day helps us to educate and inspire others in their efforts to improve their diets and to buy local. We are committed to the good health of our communities,” she added. Matthew Perpetua, manager of Supply Chain & Commissary Operations for Baystate Medical Center’s Food and Nutrition Services, noted it is common that Western Massachusetts area farms and businesses deliver a variety of foods and services to the hospital as part of its goal to provide food that is prepared with fresh ingredients. “At several times throughout the year, we purchase as much as 30 percent of our foods from local area farms such as Czajkowski Farm and Plainville Farm, both in Hadley, and other farms sourced through a local produce distributor. In addition to produce, a percentage of our milk is also sourced directly from Mapleline Farm in Hadley,” said Perpetua. “Part of our Food Day activities is promoting the use of fresh ingredients and a healthier diet. Meat, fresh produce, bakery products such as granola and milk that is sourced locally, ensures security for all local suppliers and helps the local economy. This also helps meet our high standards of traceability and freshness,” he added. Each Thursday in October, chefs in the Baystate kitchen are preparing a healthy soup or entrée made using locally-grown produce for purchase by visitors, patients and staff in the hospital’s Daly Building cafeteria. Also, on Thursday, Oct. 22, dietitians will staff a table in the North Café from11 a.m. to 2 p.m., where they will share information about the national movement to celebrate healthy, affordable and sustainable food. They will also be giving away local apples, recipes and information on preserving foods for the winter. Among the printed recipes available to take are: Thanksgiving Lasagna, Black Bean and Yam Enchilada Bake, Autumnal Vegetable Medley, and Butternut Squash Caramelized Onion and Spinach Lasagna – all featuring local vegetables from the Pioneer Valley. “Americans are not known for their healthy eating habits, contributing to the obesity epidemic, as well as diabetes, heart disease and many other health problems, noted Paula Serafino-Cross, RDN, a clinical dietitian in Food and Nutrition Services at Baystate Medical Center. 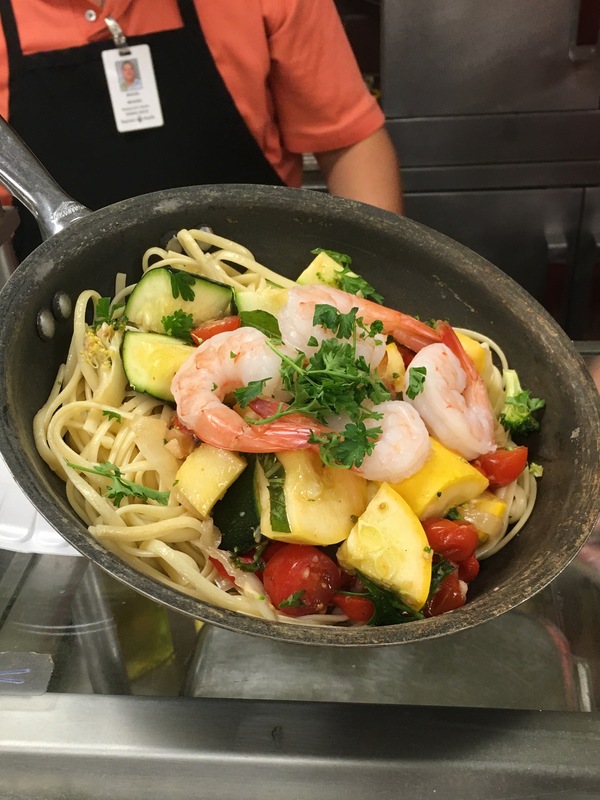 “A healthy eating plan includes eating ‘closer to the ground’ with more local fruits and vegetables and cooking from scratch when possible,” she added, noting healthy eating needs to be combined with eating smaller portions to maintain a healthy weight. To encourage healthy eating, Serafino-Cross said anyone visiting their table in the cafeteria will be eligible for a free raffle to win a winter share of vegetables from Mountain View Farms in Easthampton. Food Day is a nationwide celebration started by the nonprofit Center for Science in the Public Interest. Add your Food Day event to the searchable national directory.